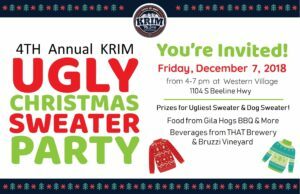 Join HSCAZ on Friday, December 7th for KRIM’s Ugly Christmas Sweater Party. This year dogs can also compete for Ugliest Sweater! We will have adoptable dogs at this event looking for their forever families! Come join us for drinks, food and a lot of fun!